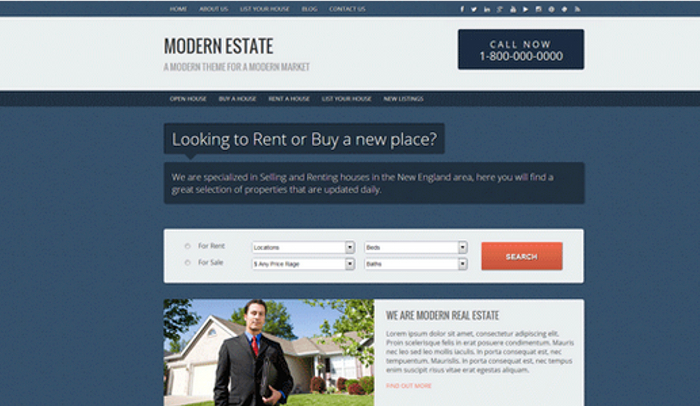 Real estate websites should be focused on two elements. The first is obviously the details of the properties being listed or highlighted. The second is the images that offer a real and expansive sneak peek into what is being presented. The real estate industry cannot be boiled down to just classifieds. There are specialized brokers or realtors. There are general construction companies and facilitating vendors, contractors and networking professionals. There are real estate websites that are just out there to help homebuyers and home sellers or commercial property owners, managers and tenants with information. The focus on information and images must be factored in while picking the best free WordPress real estate templates. Any website template that naturally doesn’t facilitate the hosting of immersive or engaging images within the existing layout would require a lot of hard work on the part of the webmaster, designer or DIY website developer. Also, if there are no or few provisions to list the all important details of the property along with the images, that too will impair the whole objective. 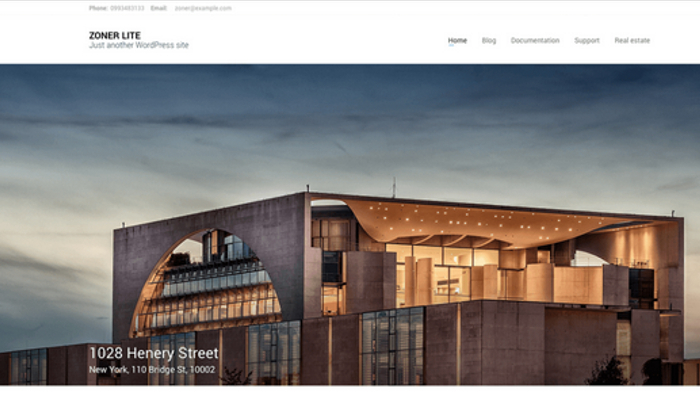 In here, we shall take a look at some of the best free WordPress real estate templates that are raring to go. All you would need is the content you wish to upload on the site. You can call this the classic real estate site. You may consider it ideal for a real estate blog, for a website of realtors or real estate agents in a given area, for a realty company in a large city or just an informative website being run by enthusiasts. No matter what your objective is, this classic theme will certainly help you to get the desired traction. The professionally designed website is rather minimalist with the various elements but factor in the layout, the sizing of the image, the information pertaining to the various listed properties and the ability to host latest news spanning a substantial part of the layout would certainly impress those who are looking at buying or selling homes. After all, that is the audience real estate websites will be catering to. Real Estate Lite is an ideal website for real estate brokers or agents and firms. The customizable website is easy to use. There is provision for the widely used plug-ins and optimum support. Modern Estate is a responsive website with a minimalist but very sleek design that will perfectly suit professionals working in the real estate industry. Developing using cutting-edge HTML5 and CSS3, the template comes with various color schemes. There are many page templates that you can choose from and a plethora of plug-ins that can go onto the website. The website template already has various real estate functionalities like property listings, agent profiles, testimonials and there are live front-end text widget editing options. This website will work for the stay at home dad or mom who wants to dabble in some real estate. This website will work for the savvy realtor who has happened to be in the limelight for a while now. This will work for any aspiring or veteran real estate agent in any state, city or town. A website is all about enticing the audience, drawing them in and then captivating them with the information being provided. The first objective is to have that hook which will entice someone enough to check out the website further. Zoner Lite succeeds in captivating at first sight. The large image showcasing the prized listings or what’s on offer will be enough to generate traction. Then the nifty presentation of facts and important details will keep the audience hooked. Thereon it is only a matter of relevance of the listing. 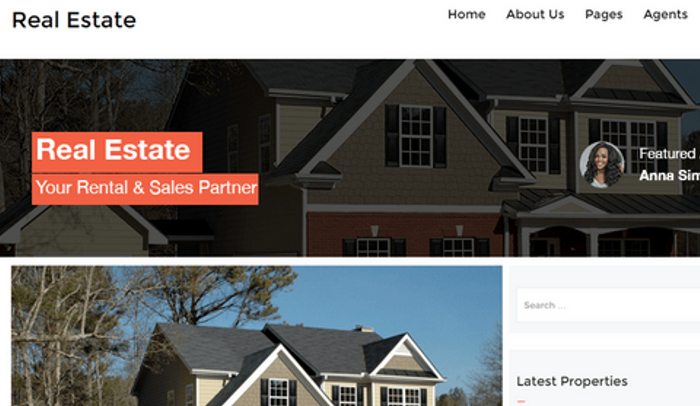 Zoner Lite is the free version of Zoner Real Estate WordPress theme. 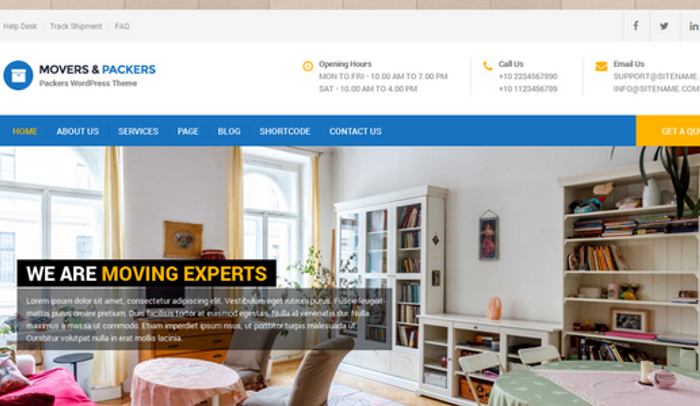 The clean flat design is responsive and also retina ready. It works on bootstrap 3 grid 1170px with redux framework theme options and visual composer support. The template allows you to add your logo and you can toy with the styling choices, the blog options, header options, menu, slider, font options, footer and social media links. There are many types of businesses closely associated with real estate. Simply because this template is known as Movers Packers doesn’t imply that only a moving company or packing company will be able to make use of it. This website theme is responsive and indeed multipurpose. It is fitting for realtors, including agents and construction firms. It is suitable as a sales page or landing page, for product launches or as a portfolio. The theme will be ideal for consulting firms, architects and certain moving packing companies. The website is simple, flat, flexible and scalable. It is compatible with contact form 7. You can work in WooCommerce and NextGen Gallery. The template is translation ready and has already been translated into twenty three languages.